Shamarr Allen is the definition of New Orleans! 1907 Jourdan Avenue is situated just past the east wall of the Industrial Canal. 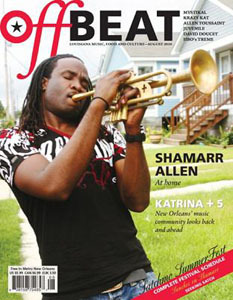 Shamarr Allen recalls growing up there, practicing his trumpet at home with encouragement from his father and Kermit Ruffins. Playing with his childhood friend Dinerral Shavers, buddies so close people thought they were brothers.